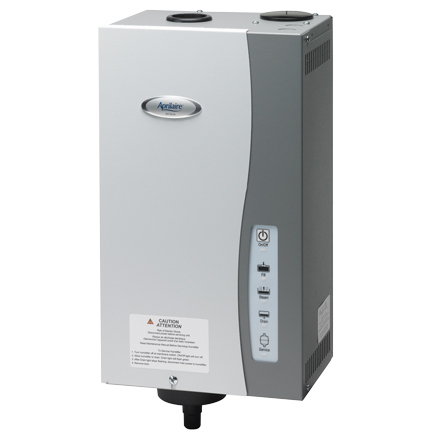 Humidifiers are devices that increase the humidity in a single room or an entire building. Whole-house or furnace humidifiers are connected to a home’s HVAC System and provide humidity to the entire home. Low humidity may occur in artificially heated spaces like your home. In winter, when the temperature is much colder outside than the heated indoor air, the humidity in your home may drop to as low as 10-20%. This can cause many negative health effects, as it may dry out the mucous membranes of your body- such as the nose or throat. Furthermore, low humidity can adversely affect items in your home such as the wooden structure, hardwood floors, furniture, books, papers and artwork. Adding moisture to the air by mechanical means is not only beneficial to your health and comfort, but it also helps protect items in your home. There are several types of humidifiers that are typically installed in homes; bypass/flow-thru, drum, or atomizing or steam Humidifiers. All of them have their advantages and disadvantages, and most require an annual maintenance to be done, and the replacement of certain components. The Flow-thru Type Humidifiers are a good cost effective solution. Water is fed through the top of the unit and flows through an evaporator pad. Warm air from the furnace moves across the pad and draws moisture out to join the air stream and provides humidity to the air. The drawback of this type of humidifier is that the water that doesn’t evaporate from the pad goes down the drain. Timers can be used to minimize waste. Drum Type Humidifiers are a system where the water sits in a pan and a round drum rotates inside. This drum has foam pads on it’s surface, which absorbs the water. Warm air from the furnace goes through the round drum to capture the water and release it into the air stream. This environment tends to invite mold spores to grow because standing water remains in the system. Tablets can be purchased to combat this issue, but it requires consistent attention from the homeowner. An annual maintenance program would consist of the Humidifier being cleaned and disassembled in spring and shut off for summer. In fall we would get it up and running again and ready for winter. 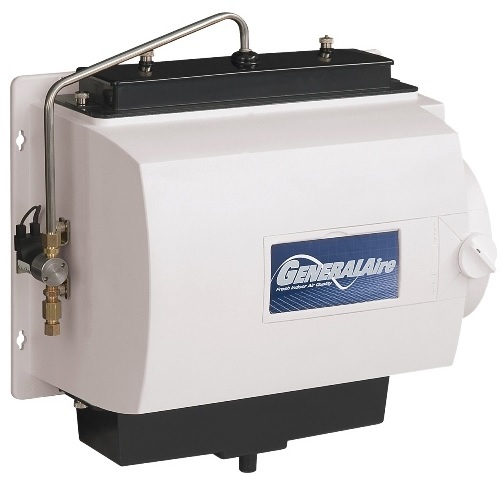 Steam Humidifiers have a metal canister with an electric heating element inside. The water is boiled off much like a kettle on the stove. The steam is then conveyed through a pipe to join the air stream through a supply air duct. The costs of this method are higher, but it’s the most effective and cleanest method and is used in many commercial buildings. We have many options of models that we could install in your home. Whether you and your family would like a Flow-Thru Humidifier or a Steam Humidifier we have you covered. Many homes have Drum Humidifiers installed, however we do not recommend doing this as it requires consistent attention from the homeowner and can be a breeding ground for mold and spores due to standing water. With knowledgeable HVAC technicians on staff we can help you find the right model for your home and family needs. Below are two examples of models commonly installed in homes. Click the name of the Humidifier to see more details on each model direct from their brand website. For our Humidifier servicing the method of service is dependent on the type of Humidifier that you have installed in your home. Humidifiers should be serviced annually as water in Winnipeg has a lot of calcium in it and when it is used for Humidification it tends to leave calcification on the Humidifier components. Most models require the filter or pads to be changed out on an annual basis. If this is required during your annual servicing there would be an additional charge for the required components. When booking in your Humidifier Service we ask that you be prepared with the Model number and type of Humidifier that you have installed in your home. We require this information to ensure that the correct parts (filters or pads) are brought to your home. Humidifier servicing starts at $99.95+TAXES. Please try to book your humidifier servicing in at least 3 days in advance so that we may ensure the proper replacement part is in stock and ready to be installed for the date of service. Copyright © Red River. All rights reserved.